Children of the Kraken: Snipers! I was searching for a smart way to use 2 ot the 5 men in the comman squad, I did't want to waste their BS skill of 4 so I was thinking about giving them a special weapon. 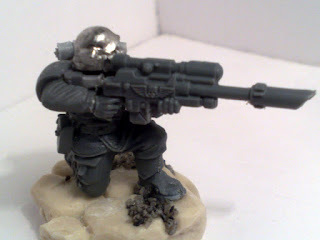 My original idea was to give them some melta guns but in all the games I've played so far I never had the chance to move the command squad near to an enemy unit, usually the stay put giving orders to nearby units and using the master of the ordnance fire. The other option was to give them an heavy weapon but since they would count as a single model with 2 wounds they would be too exposed to high strenght weapons, a weapon with S more than 5 will get rid of the whole model immediately! So the only alternative left was to make them snipers! 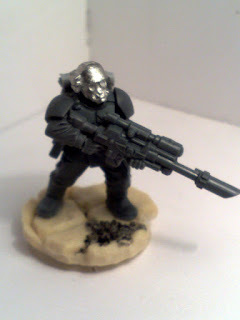 then I glued it on some standard IG arms.